Natural Gas engines suit a wide range of applications which include forklifts, sedans, light commercial vehicles, heavy duty trucks, buses, marine vessels, even rail locomotives and aircraft. The clean properties of natural gas and the absence of particulates often reduce engine wear and tear. Some operators report extended service and oil change intervals, thus reducing operating costs even further. A dedicated engine uses natural gas as its only fuel source. A dedicated engine has the advantage of being ‘optimised’ to operate on natural gas, thus ensuring maximum efficiency and optimum emissions results. These engines are sometimes referred to as spark-ignited. Some dedicated vehicles are also fitted with a gasoline reserve tank to be used if the vehicles runs out of natural gas. As the vehicle has been optimized for natural gas, these should only be used for short trips and not be used on a regular basis. 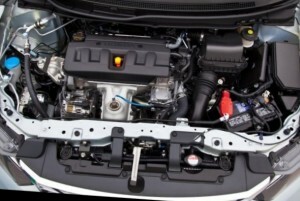 Bi-fuel engines operate on either natural gas or gasoline (or another spark ignited fuel such as ethanol). Bi-fuel engines are available either as an aftermarket conversion or as an ex-showroom ‘OEM’ vehicle. A dual-fuel engine utilizes a mixture of natural gas and diesel, with the natural gas/air mixture ignited by a diesel “pilot”. The diesel is injected directly into the combustion chamber, while gas is introduced into the air intake by carburetion or by gas injection. The mixture of natural gas and diesel varies according to the load and the duty cycle of the engine, ranging anywhere from 80% gas down to 0% gas. At lower engine loads, diesel use tends to be higher whereas at higher engine loads it is possible to use a higher proportion of gas. Dual-fuel engines are usually the result of a conversion of a diesel engine and have the advantage of not being totally dependent on natural gas for fuel supply. Thus, if a vehicle runs out of natural gas or is away from an available NGV fuel source, it is able to operate solely on diesel. A relatively recent technology development, a tri-fuel vehicle combines a ‘flex-fuel’ vehicle and a natural gas vehicle. A flex-fuel vehicle uses gasoline and ethanol, either exclusively or blended together. Thus a tri-fuel vehicle can operate on gasoline, ethanol (or both) or natural gas. Tri-fuel vehicles first entered the market in 2005 in Brazil, where ethanol and natural gas are both widely used for transport. 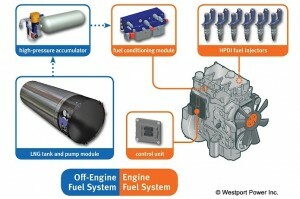 A proprietary technology developed by Westport Innovations (Canada). HPDI technology involves the injection of both diesel and gas at high pressure directly into the combustion chamber at the end of the compression stroke. Like a dual-fuel engine, HPDI relies on diesel for combustion to occur. The system differs from the dual-fuel system in the manner in which the fuels are mixed and, in comparison to an equivalent diesel engine, is reported to deliver the same high power and torque with same or higher efficiency. Information on various combustion and injection methods can be found on the Engine Technology page.